In this episode, we catch up with Dennis Yu, Chief Technology Officer of BlitzMetrics and one of our favorite social media marketing experts, to get his take on what Facebook’s data problem means for marketers (hint: Dennis sees opportunity!) as well as tactical strategies for helping businesses get value with video and authentic stories on social. Recorded on location at VendastaCon 2018, in Banff, AB Canada. BlitzMetrics is a digital marketing company which partners with schools to train young adults. Dennis’s program centers around mentorship, helping students grow their expertise to manage social campaigns for enterprise clients like the Golden State Warriors, Nike, Ashley Furniture, and Rosetta Stone. 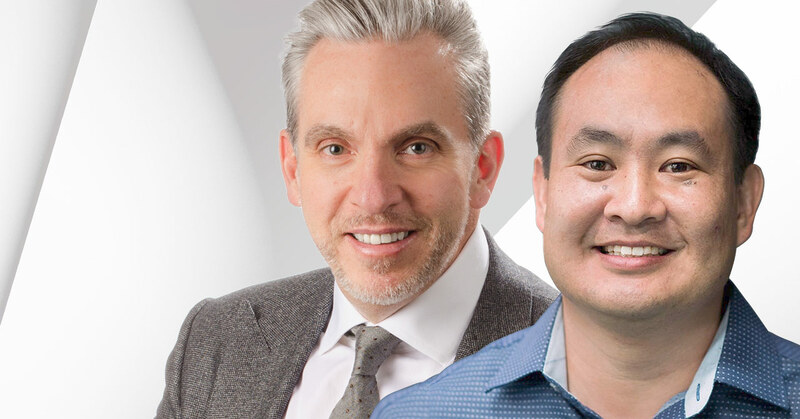 This week, Dennis Yu, and I’m gonna be speaking to him about everything going on with Facebook and some tactics that you can use as a salesperson to really brand yourself. Pointing a camera at yourself and sharing something interesting is a great way to get engagement on social media. SMBs are having a hard time being on camera and having a hard time making those videos, and I’m gonna get advice from the expert on how you overcome that and how businesspeople and individual entrepreneurs can really win in social media marketing. It’s all coming up with the one and only, world famous, Dennis Yu. Dennis: George, you’re one of my favorite people too. George: Well, we met, I was trying to think the other day how long ago we met. It was probably four or five years ago we met in New Orleans. Dennis: I think it was like six or seven because that was Pubcon. George: Yeah. It was a long time ago. George: So, Dennis, your career is on a rocket ship, and you’ve been working really hard at it. You’re one of the hardest-working people that I know. I had someone come up to me yesterday and they said, it was one of our young staffers at Vendasta said, “Yeah, Dennis Yu, he was on his laptop working and everybody else was at the social and he’s over in the corner doing work.” I said, “That’s Dennis.” Let’s talk a little bit about that work ethic. Because you’ve been like that since I met you. I’m sure you’ve been like that your entire life, and it’s really starting to pay off for you. Dennis: It really has, George, in the last year. And what people don’t see, for those that are just starting to become successful, is the 10 years-plus, the 10,000 hours. In my case 50,000 hours of digital marketing back from 1998. And only now is it starting to pay off because of the relationships that I built. Think about your best relationships. Think about like when we met, you, me, and Brendan getting drunk, you know, in New Orleans, and now that’s starting to bear fruit. And I think we all understand instinctively relationships that would count, and it takes hard work to maintain them and not go away. Which is why the best friends that people make are usually in college, but then it falls away when they get married and have kids and all that. George: So you mentioned the digital marketing challenge. Now, I was thinking about this as I was reflecting to come to VendastaCon. And I have a couple of speaking spots that I had to do at the convention. I’m always trying to bring new information and new value. This is a tough story to tell. It’s a tough industry to be in because the change is so bloody fast. Dennis: It does for those people that are seeking the red herring or the trick or the shortcut, but you and I know based on relationships, things like Facebook or Google with search are all algorithmically-driven, and people freak out over algorithm changes. But what’s actually going on is the algorithm is trying to figure out who actually is friends with who, and who actually has high authoritative content, who actually has a product that people are talking about. And when you do that, that’s when the algorithm changes are always in your favor. So every time Facebook makes a change and people freak out, we smile because it’s to our advantage. George: Right. And the advantage meaning that you’re able to teach and educate and help businesses move forward with that change. Dennis: Well, we get media attention. So I was on CNN Worldwide three times last week, flew to Atlanta. But more than just us, it’s better for the people that practice the fundamentals, that understand that if you’re going to drive sales, we all want conversions, you still have to sequence them through awareness to engagement to conversion. That three-stage funnel is still, know, like, and trust. And it’s still organizing your content based on why, how, and what. And as long as we all practice those fundamentals, we’re always gonna win and we’re never worried about the changes. When you look at pros like LeBron James, the basketball player, he’s always practicing the fundamentals with his free throws and dribbling and that kind of thing. And I think us as digital marketers, we’re so caught up with the next trick that we forget about the fundamentals. George: So it was a little over a year ago you and I met. I can’t remember what city we were in, somewhere in North America, and you challenged me on my personal brand. And listen, best thing that ever happened. I really appreciate the efforts that your team has put forward on that. Because, you know, what you said to me, and, you know, it’s a tough one because, you know, I like to think that I’m Saskatchewan and humble because I’m just from a small town in Saskatchewan. But you were challenging me saying, “If you’re really going to conquer local and you’re going to be a trusted advisor, you’ve got to build that personal brand.” And let’s talk a little bit about some of the work that we did there on building that personal brand and talk about those steps. Dennis: Yeah. So the first step, like you mentioned, is getting over the, “I’m trying to be famous” kind of thing. Because when you build a personal brand, it’s not about you. It’s not about being famous or being on TV, it’s about you with such a mission that you wanna share, you wanna help, you wanna educate, in the case of local, right? Helping the partners, helping the underlying businesses, helping the media companies. You wanna teach and share what you know so passionately, connect people so passionately that you’re willing to go out there and share that, and be on the stages, and write articles, not to elevate your brand and get 50,000 views on a video, but because you wanna help. And so when you measure that ROI based on the impact that you’re making, then people naturally will gravitate towards you, that’s your why, they respect your expertise, that’s your how, and then they buy your product, which is your what. And personal branding is nothing more than connecting your why, which is why George Leith is in this business, why you have such great relationships, all the way to your what, which is, “I need to drive a sale.” It’s connecting that why to the what, and it’s using the how. The how is your expertise. The how is the “Conquer Local” podcast, where you’re sharing expertise. You’re not selling anything, but you’re building relationships. You’re creating frequent lightweight touches over time. And what we did together a year ago was look at all the amazing content that you’ve shared, the seminars that you’ve spoken at, tons of video that’s on YouTube, and start to package up little one-minute tidbits to earn people’s attention. They’re not going to sit down and spend an hour with you on a Friday afternoon and watch you, even though you’re compelling, you need to earn that attention through a one-minute touch, through an article, through some kind of component. And by assembling those things like money in the bank that you already have, and we put that out there on Facebook and we boost it to fans of Vendasta, people that like Gordon Borrell, people that are in local online marketing, they like Greg Sterling, they go to Pubcon, Search Engine Strategies, all these different places. It’s like we’re replicating 100 George Leiths to put out these greatest hits, these little tidbits where you’re sharing awesome knowledge. And that’s all personal branding is. It’s about sharing things that are of high value, where you’re adding value. It’s not about, “I’m trying to speak on stage and be a keynote, and I’m, you know, Tony Robbins,” or something like that, right? George: So let’s bring this to a local business person. And an example is, I had a friend reach out to me the other day and obviously has been seeing some of that content, and he’s in the real estate business. He’s a very, very successful real estate agent. And his comment to me on LinkedIn was his…he has my cell number, by the way, and he has my email, but he reached out to me on LinkedIn. He said, “I’m wondering if you would be able to go for lunch, I’ll buy, give me some advice on how I can build my brand.” So for the real estate agent or for the dentist, you know, I’ve got a buddy who’s a great dentist in Edmonton, Alberta, Canada, and getting him to share his personal brand, it was like pulling teeth. George: Because, you know, he doesn’t play in that space. So what is some advice that you could give to those people? If they got 30 minutes with Dennis Yu, what would you suggest that they do? Dennis: First off, they have to overcome any kind of preconceived notions about being in front of the camera or telling their story or what it costs or how much effort it is. Who wants to go to the dentist, right? Who wants to file their taxes? No one wants to do any of these kinds of things. But if you realize that, “Hey, if I want to serve the community, I’ve got to put content out there.” Number one thing, people make all these excuses about not wanting to be on the camera, right? “Oh, my website is not ready. I don’t like how I look. I’m too busy this week. I’ll do it next week. It’s too expensive. I don’t have the camera equipment.” You can pull out your iPhone. And if you don’t wanna be on camera, for all the different…like, “I don’t wanna be on camera,” right? Then you interview other people. If you’re that real estate agent, you know that you are in the relationship business, so talk to people that you’ve been helping and ask them about their situation. And they’re just telling their story. “Yeah, I just moved to town. You know, we’ve been looking for a house. I’ve got two kids. You know, this is where I work.” You’re just collecting stories of other people. You’re acting like a reporter. If you don’t wanna be on the camera then be behind the camera as a reporter. Pull out your iPhone and learn to collect one-minute stories. And you would think that if you’re a real estate agent or a dentist or whatever and you’re interviewing people about, you know, their kids winning some kind of soccer championship or just like any kind of story, you would think that has nothing to do with their ability to make your teeth straight or make them white or do root canals, but you’d be surprised people make decisions based on their heart, based on who they trust. They have no way to tell whether that dentist is actually any good at being a dentist or not. So people make decisions based on who they like. When you have a frequency of lightweight touches, who are you gonna choose? The one that you’ve seen a few videos where you can see like they seem like a nice person versus some other random Google search results you pull up? Who are you gonna choose? George: Right. And it’s branding at the very elementary level. And I think that it gets overlooked because you wanna build that brand and you wanna…so you buy business cards, you put a sign out in front of your business, you do all of these things. But then we live in a different world now because everybody is connected. Dennis: Yeah. And people make decisions not based on your business card or what kind of jingle you come up with on TV or some kind of, you know, trick that you pull where you give out free hot dogs, you know, car dealerships do things like…furniture companies do stuff like that, it’s really just getting exposure in the local community with one-minute videos. People buy from you personally because of your personal brand. You’ve gotta tell your story. How you got started, some childhood experiences that lead into why you believe what you believe, or about your family or things that you might think are kind of personal, some kind of vulnerability. Dennis: If you are a larger company, then maybe you have a founder, maybe you have some people that you send out on the road to speak at conferences, maybe you have some key customers that you’re willing to talk to, where it’s not a testimonial. It’s not them to say, “Oh, yeah, I really like Vendasta and they have an amazing platform.” No. You’re being a journalist and you’re trying to collect stories of what’s meaningful to them, because people resonate emotionally with stories. People buy because of the why. They buy because of the trust, not because of a rational calculation of how much money they can make and how many clicks they’re gonna get to the website or cost per leads or things like that. People buy based on that why. So personal branding means you’re gonna assemble what we call a Topic Wheel. And the outside ring of the wheel are all of these different people that are telling their one-minute stories. Not five-minute stories, these one-minute stories told in a particular way, where people will identify with the why of that particular story. That why sequences to the how. The how is, “How do you clean your teeth? How do you, you know, choose what kind of car you have?” You’re sharing your expertise, and ideally, a one, two, three, four, five checklists, recipe-driven kind of way. You’re demonstrating knowledge. But it has to start with the why because people have to know you before they can like you before they can trust you. And the larger your agency is, the more figureheads you have, the more lighthouses, which are like preeminent, high-power clients. Like the Warriors, they’re a high-power lighthouse client of ours, so they do the marketing for us. Most agencies that we’ve seen, they have a mishmash of clients because they just service people in Baltimore, Maryland, right? But if you can choose one or two of those lighthouses, build stories around them, interview them as if you’re a journalist, you’re not talking about yourself, it’s not a testimonial, you’ll find that you can get 50 or 100 more of the same thing. So, us putting out the Warriors, the NBA basketball team is an amazing example. Documenting how we do it. You have to have one that’s willing to talk about what they’re doing, not all secret. That’s driven tons of other sports teams our way because we’ve done that case study together with Facebook. We’ve done it openly. We’ve put it on the Facebook blog. So, anyone that’s doing digital marketing at any of these other sports teams, they’re not gonna wanna go against what Google and Facebook have to say against the number one team in the NBA. George: You talked to me at one point here over the past year about, you know, doing some air cover for a sales organization. So you had a sales organization you’ve targeted, there’s a prospect that you would like to get. And you told me that what we’re able to do is to take that and build an audience around all of the key decision makers and influencers at that organization, and then serve up messages way before you ever go in to do the presentation. George: It’s very possible to do that. Dennis: Yeah. So imagine, George, you’re gonna go visit with XYZ people next week in Chicago. Well, if we have their email addresses, we can upload that into LinkedIn, Facebook, and Twitter and hit them with messages so the only people who are on that email list are only people who have those job titles. LinkedIn’s got the best job title targeting, right? They can see your stuff. And we’ve seen this work like a charm thousands of times. When we meet people and they’ll say, “Man, I’ve been seeing your videos all over the…” And they think that you’re spending millions of dollars advertising, when you’re spending just a couple bucks, you can spend a dollar a day, because it’s a limited audience. George: So is that an ad on the right rail or is that actually showing up in the newsfeed? Dennis: So with LinkedIn, you wanna choose sponsored stories, which look like regular posts that you’re boosting. Same thing for Facebook, you’re not trying to run right-hand-side ads, you’re taking regular organic posts, you’re posting organically like you would, and you’re boosting that to a particular audience. Now, that audience can be an uploaded custom audience, which is people who’ve been to your website, people in a particular email list, or it can be a saved audience, which is all the people that have the title of regional sales manager, all the people that are fans of a certain conference, all the people that, you know, live in Saskatoon. George: Okay. So there’s one thing I’ve gotta call out. I’ve been watching. I’ve been reading. There’s some things you don’t like when people are reaching out to you and they don’t really have a connection. You know, I saw a post you were talking about that just the other day. Can we talk about why you don’t like? That’s not a good practice or it irritates you or, you know, why? Dennis: Well, I was on TV a few days ago and I got 600 emails in the next 48 hours. Not counting all the Facebook messages. And you know what people are asking? “Dennis, can you get me a meeting with Mark Zuckerberg? Can you get me a blue checkmark? Hey, I’ve got this great idea, will you be an investor?” Like, you can imagine what that’s like, right? Anyone who’s attained even a medium level of success gets hit up like great. Like, you have all of these friends all of a sudden. You know what I mean? So, you know, the same is true in sales, you want to be able to give value before you ask for anything. Because if your bank account balance with someone who’s a cold prospect is zero and you ask for something, you go instantly into withdrawal. So I like to make lots of deposits. And so by making one-minute videos that we put out there, they’ve already got a chance to consume some content, get some value. By the time we talk, I have a positive bank account balance with them and then I can ask for something because I’ve earned it. George: What was this tactic that I’ve seen you deploying where you write a line, a hook line on LinkedIn, and then you put a couple spaces there and put the rest of the story underneath? Dennis: Yeah. That’s called broetry. We were featured on Reuters a month ago about that. So that only works half as good as it used to. That was a way to game the system, just like there’s certain things you do to like game search engine results or, you know, game Facebook with memes. So the [inaudible 00:16:39] model is, you tell your story one line at a time. Every paragraph is just one sentence, and you open with something that catches their attention. Like, “She rejected me and I felt utterly hopeless.” And the people wanna read the next line, right? George: Absolutely. Everybody likes a train wreck. Dennis: And so emotion is what leads. So think about any kind of knowledge you have. Think about relationships, think about what you sell, and think about where the emotional hook is, and you open with that. Like if I had an article on like, “How do you not get your Facebook ads disapproved?” We could say, “Here’s 12 things you could do to not get your Facebook ads disapproved,” blah, blah, blah. And it could be a great article, but if we don’t have an emotional hook. The hook could be, “My friend had his Facebook ads disabled and it tanked his business,” right, “And then he lost this much money.” So you have to open with that. You have to establish pain because then they’re gonna wanna read the rest of it, right? It’s like clickbait basically on LinkedIn. What’s really going on with Facebook? George: So a few things in the news right now that we wanna talk about. You mentioned earlier that you were on a plane to Atlanta the other day. I saw you on CNN a number of times. Facebook is in the news, stock took a hit over this data issue. Give me the Dennis Yu take on this. Dennis: So Facebook lost $100 billion of value wiped out in 48 hours, right? It’s crazy. A $460 billion company took a…a half a billion dollar company lost $100 million…$100 billion, sorry, with a B. People like to freak out. The media likes to freak out. They like to play it up. Partly, that’s to my advantage because I get on TV more. But I’m trying to tell these folks, “Look, nothing has actually happened with Facebook.” There was no security breach. There was no, like, data hacking, Russians manipulating the media, you know, electing Donald Trump kind of stuff. None of that is true. It wasn’t technically possible. Several reasons. One is that Cambridge Analytica got their hands on 50 million Facebook user profiles that they claimed that they were building huge, huge psychological in-depth profiles off of. That’s impossible because the data cannot be uploaded to Facebook based on changes they made in the app platform four years ago. Secondly, what happens in the Newsfeed? If George Leith likes Donald Trump, I know you like Fox News but let’s say, you know, if you…what happens when you click on multiple things related to Fox News? What do you think Facebook is gonna show you in the newsfeed? If you like guns and you keep clicking and liking and watching videos on guns, they’re gonna show you more videos and pictures and articles about guns. So do you really think people are getting their opinions changed? The algorithm is based on…it creates an effect called a filter bubble, which is whatever you like, they’re gonna show more of that same thing. When was the last time you changed your political view because of someone’s Facebook post? George: I’m completely in agreement. It’s not something that I would make a decision on off something that…a flier that I read or something that I see online. I’m going to form that opinion and make that choice over a period of time, based on a whole bunch of factors. George: No one ever reads that. Dennis: Okay. But you know what it says, what they’re gonna do with your data if you sign up for this program because you wanna earn miles for this credit card or whatever, right? You know what happens to that data? We all know what happens to that data. Okay, that’s the problem, right? And as long as the people are willing to trade privacy for convenience, this is gonna be a growing issue. Because guess who’s got the most data on users and where they’re going and, you know, what they’re buying and what they like and what…? It’s Facebook. Facebook has more time on site than Google. Facebook has, I think, something like 46% of the logins of all the people that…because you can log in with your Facebook instead of logging in by making a username, password, that kind of stuff. So Facebook is the linchpin or they’re the whipping boy, the lightning rod for all this privacy stuff going on now. But you ever, like, drive on the…I know in Canada you’re going between these provinces, it’s like a long drive, right? Dennis: And so if you wanna speed, like most people speed, so I tend to be the kind of person where if someone else is speeding, I’m gonna get behind them so they get pulled over, right? So you see these trains and people. So Facebook is the lead car, and so you have LinkedIn and Google and Twitter and Snapchat and all those guys are following in right behind Facebook because they know that Facebook is getting the ticket and they get to speed without getting into trouble. That’s what’s going on right now. George: So we’re at an annual convention this morning. I’m gonna do a video because I’ve drunk Kool-Aid. I’m following what you want me to do. I go to LinkedIn, you know, I’ve got 12,000 people that I’ve connected with on LinkedIn, and I press the video button and this amazing thing happens. It’s completely changed. I’m able to put a filter over top of it. I’m able to do all these…it’s amazing what they’ve done there. Let’s talk about LinkedIn because I know you’re a big fan. Dennis: LinkedIn is the new Facebook. LinkedIn is where we’ve been building business. If I had to choose between having…I wonder if there’s any Facebook people listening, but if I had to choose between keeping my Facebook profile or my LinkedIn profile, I’d keep my LinkedIn profile. I generate more sales, more connections, more authority, more of like everything off of LinkedIn. Because all the things that were amazing on Facebook, that made it awesome, are now starting to show up on LinkedIn. You can put video. You can start to boost certain kinds of posts. I’ve made some posts, individual posts just on my LinkedIn profile, mine is about the same size as yours, I think I’m at like 14,000 connections, that have gotten 2 million views. And I’ve gotten a whole bunch up over half a million. Even Logan has got, and Logan had only 500 connections until recently on LinkedIn. So don’t think it’s because it’s someone who’s famous or anything like that. Even he is getting posts that are getting 200,000, 300,000 views and 1,000 likes per post if you know how the LinkedIn algorithm works and posting in a certain way where it gives you huge distribution. Because now LinkedIn’s got a ton of traffic. This Microsoft acquisition is only going to increase that, yet there’s no competition. So, man, it’s like the early days of Google like 17, 18 years ago. It was like Facebook 11 years ago. LinkedIn is the new wild ground that people are only starting to realize is more than just a place to go look for a new job. George: And it’ll be interesting to see how Microsoft further integrates LinkedIn into their ecosystem. Dennis: Well, it’s about training and education. Our buddy Jason Miller, he’s the global head of content marketing at LinkedIn. He used to work at Marketo, we worked together there. But he said that… Wow, let me back up one step. So Jeff Weiner, who runs LinkedIn, he’s the CEO now, he used to be my boss at Yahoo, and he said that Facebook is a place that you go to waste time and LinkedIn is a place you go to invest time. And LinkedIn is shifting from being, you know, a resume polishing place to your business newsfeed, to see what your friends are doing, to educate. That’s why LinkedIn bought Lynda. That’s why they’re integrating all these other apps. That’s why they’re making changes in LMS, which is LinkedIn Marketing Solutions, to allow all of us to publish better. That’s why they released Video Insights last week, right? You can see how your videos are performing. And I’m pretty sure, because I met with these guys recently and they showed me some new things that I thought were impressive, you’re gonna be able to see boosting posts. You’re gonna be able to see integration with marketing automation systems. LinkedIn now has a retargeting pixel. So all the amazing things that you could do on Google and Facebook, LinkedIn as the two-year-old toddler, is now starting to get. So it’s gonna be super powerful. George: Yeah. And there’s no end…you know, there’s no end of resources at Microsoft, so, you know, it’s…and I’m not saying that any of that stuff they’re doing is easy, but it’s easier because resources are not an issue. Dennis: Well, they kicked out their old CEO. And it used to be a Steve Ballmer game and now Satya is the CEO. And he realized it’s…because, you know, Windows used to be a monolith. Like, Windows was how they got onto the desktop. People don’t buy desktops anymore. Windows they tried to do as a Windows Phone, they tried to do…they tried to, like, jam Windows into everything, and now they understand it’s about platform. It’s about collecting users through wherever they are. So it’s, you know, putting Microsoft, you know, on Mac, for example, which is something they didn’t really wanna do. So Microsoft realizes that they can’t just be the…because it used to be a Microsoft-only game, right? Twenty years ago, it was called the Wintel monopoly. Dennis: That’s the only game in town. Now, Microsoft is putting their stuff across all platforms. So that’s why you’re gonna see things like LinkedIn and the other acquisitions they’ve made become more powerful. George: And let’s talk a little bit about BlitzMetrics for a moment and what you do and some of the clients that you work with. Two months ago, we used the Facebook Offline API to be able to match people that actually bought furniture with them being on Facebook, having watched our videos, us having collected their emails, and we found, because we were kind of afraid because that was the moment of truth because we were all just sort of like believing like it’s good to do things in digital. The moment of truth showed us that we had a 1,000 ROIs. So every dollar that we put in drove $10 of people actually coming into the store. And I think that was…our cost to drive a new person into the store to buy something was $30 or $40. And, you know, in the furniture industry, which is kind of low margin, we’ve gotta do it for under $70, right? So that was automatically profitable. And now we’re validated, and now we can spend more money. And I think a lot of folks, if you can tie in the point-of-sale data, or if you’re a dealership or if you have some kind of…you’re a retailer and you’ve got a point-of-sale, Facebook has this free thing called the Offline API, and you can integrate that data. And now you can prove the ROI on social. I’m just waiting for Google to get there. I mean, Google has got one too but it’s clunkier. George: You know, we talked about personal branding off the top, but there’s a lot more that you do. Let’s get into that a little bit. Dennis: So we are an education company that we’re creating jobs for young adults so that they can become digital marketers, not because they’re just getting a certificate from our programs, but because they can implement and get on-the-job experience and get paid for their education working on packages that we resell through our partners, right? So imagine the apprenticeship program of Europe of 200 years ago brought to the United States, brought to Canada, which is the way people have always learned when they get out of college. We’re not saying, “Oh, you know, Gary Vaynerchuk, you should just, like, drop out of college and be an entrepreneur.” No there’s a there’s a combination of these. So our programs, thank goodness we have Facebook supporting us, Google is contributing. We have the largest conferences like VendastaCon, Social Media Marketing World, DigitalMarketer has Traffic & Conversion Summit. All of these guys allow our young adults to come for free, right? And they get access to the education. It’s great for the community. Because last thing any of us as business owners or leaders or agency owners wanna do is learn how to set up Google Tag Manager and pixels and make reports and stuff like that. Would you rather have a young adult do that for 15 or 20 bucks an hour? Dennis: So that’s the arbitrage play that we have as BlitzMetrics. George: You know, you and I had dinner over the Christmas season in Scottsdale. I know that you guys are headquartered out of Scottsdale, and you were telling me that you were continuing to grow that group. So how large is that group now? George: Okay, great. So it’s going really well. Dennis: We’re hiring probably 10 to 15 a month. So that means that’s putting stress on our training program. But the training program is everything because that’s how we get the word out, that’s how we drive leads, that’s how we educate partners, and that’s the same thing that our young adults go through when they get certified. George: So the other item is you do some conferences on an ongoing basis where people can come down and learn for a few days. So they follow you on LinkedIn, they’re gonna see mentions of these events where they could come to Scottsdale and you put them through a weekend boot camp and train them. Dennis: Yeah, that’s a three-day VIP experience. We alternate between GoDaddy’s headquarters and Infusionsoft headquarters. Those are two other partners of ours. So if you’re an entrepreneur, if you’re an agency owner and you’re trying to grow your business, that’s at blitzmetrics.com/workshop. We also have coaching programs. So you can also see that…I think it’s like 159 bucks a month. And our guys will actually support you and tech support. There’s a private group. We have weekly webinars. We’re doing everything we can to put the knowledge that we have out there, which is cool because not everybody gets to meet with Facebook all the time and have weekly calls and get to work on new products, get your little, you know, blue book that we gave you from hanging out at Facebook’s headquarters, right? Not everyone gets that experience. So we’re just trying to share everything that we know. And for those people that maybe they’re not ready to pay for one of these kinds of things, we put a ton of stuff out there for free. So just follow me or Logan on LinkedIn, or go to our site, you’ll see we have a ton of information out there. We wanna train another million young adults and then unleash them on all of these local businesses. The reason why we’re here with you George and Brendan and everyone else is because we believe that local is the future. That’s gonna be where the jobs are created of the kids that are coming out of college. That’s where the money is being spent. That digital angle, all that money is gonna be shifting into digital, but it’s just like the yellow pages, it’s gonna take some time. So we wanna be there. We’re here for the long run. George: Well, we really appreciate you sitting down with us today, Dennis, and sharing those insights here at VendastaCon. Thanks for joining us on the podcast. Dennis: We love you, George. George: Well, what a great episode from the one and only Dennis Yu. I can pretty much remember every single meeting that I’ve had with that gentleman over the last four years, from our very first meeting in New Orleans. And Dennis has taught me a lot about personal branding. You know, I’m approaching 13,000 followers on LinkedIn, and a lot of that uptake and getting those followers has been because of the things that Dennis has been teaching me about my personal branding. And that said, you know, the one thing that I have a hard time doing is listening to myself and watching myself on video. I like to joke, but it’s actually the truth. Usually, when I watch myself and listen to myself, there’s a bottle of Bourbon and a box of Kleenex involved because there’s some crying and I usually have to have a couple of drinks to deal with all the stupid things that I did. But looking back and watching those videos is how we improve our delivery to come up with a great message and a great presentation. Dennis’ strategies are bang on the money when it comes to getting you ROI. Make sure you’re subscribing to the “Conquer Local” podcast. We thank Dennis Yu for joining us this week. We’re on iTunes, we’re on Google Play, we are on Overcast and we’re on SoundCloud. So whatever you use, there’s no excuses, you should be able to subscribe. And we’re looking for your questions and comments and ideas. I wanna hear it. Search “Conquer Local” on LinkedIn and let’s chat. I always love seeing those messages coming in. We’ve got some great episodes planned in the months to come from that feedback that we’re getting from our listeners all over the world. That’s it for this week. I’m George Leith. I’ll see you when I see you.